Acer platanoides , var schwedleri Nichols. Acer platanoides , f. stollii Schwer. Acer platanoides is a decidous maple, native to Europe. It is commonly planted as an ornamental along streets and in parks. It has escaped and invaded natural forested habitats all over North America. The dense canopy of A. platanoides's shades out native species and the shallow root system prevents native species from establishing. Its foliage releases toxins that alter the soils fungal and microbial composition. The full impact of this species has not been seen yet as the majority of Acer platanoides are still in the sapling stage awaiting openings in the canopy. Acer platanoides is a deciduous tree with a broad, rounded crown that can reach heights of 28m. The bark of young trees is smooth and gray-brown, on older trees the bark becomes darker and shallowly furrowed with long narrow, somewhat interlacing ridges. Leaves are opposite, simple, and palmately lobed with 5 to 7 lobes and long, pointed teeth. Twigs are stout, brown and have large turban-shaped, green to purple terminal buds with large bud scales. The leaf is dark green above and paler below. A purple (nearly black) leaf variety known as 'Crimson King' is widely planted. Flowers are bright yellow-green and appear in early spring before the leaves, with male and female flowers usually on different trees. The fruit is a widely divergent 2-winged samaras, 3-5cm long in clusters with a relatively flat seed cavity. Fruits mature in late summer and persist into the winter. A. platanoides has a distinctive milky white sap that oozes out of leaf veins and stalks when broken. The leaves turn yellow late in the fall. (Pennsylvania Department of Environmental Protection, 2004; Virginia Tech Forestry Department, 2005). This species also tends to hold its leaves later in the fall than most deciduous trees in eastern North America (Christopher Webster., pers.comm April 2006). Acer platanoides is commonly planted as a shade tree because of its disease resistance, tolerance of poor soils, and overall attractiveness. Because of its tolerance to urban environments combined with its ease of propagation and a variety of desirable cultivars it has been overused as a street tree. It became a heavily used species as it was readily available when Dutch elm disease eliminated most American elms (Ulmus americana). It is also inexpensive. (Harrington et al. 2003; Meiners, 2005). A. platanoides is used sparingly as a lumber species in Europe for veneer and for specialty items such as tool handles, gun stocks and violins (Munger, 2003). Acer platanoides has naturalised to nearby woodlots, forest edges, and fragmented forests from its ornamental plantings. Also, from these areas it has spread further into various undisturbed forested habitats (IPANE, 2004). In both its native range in Europe and introduced range in North America A. platanoides inhabits humid temperate regions. The tree is easily transplanted, grows quickly and is adapted to a wide variety of soils (including slightly alkaline) and can tolerate shade, drought, and coastal conditions (Gilman and Watson, 1993). 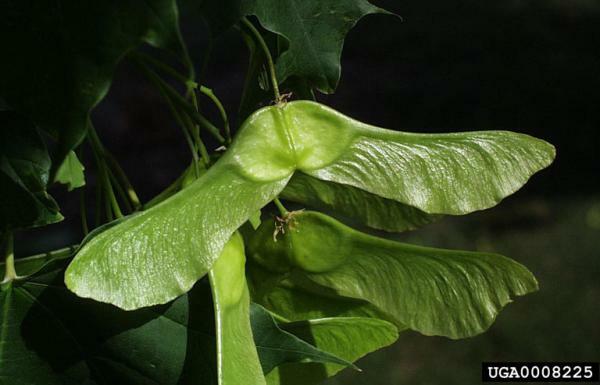 Munger (2003) reports that, \"Acer platanoides is insect pollinated. Seeds are wind-dispersed and the dispersal distance from seed source is enhanced by winged samaras. Samaras dry substantially before dispersal and seeds are desiccation-tolerant thereafter. Seeds are dispersed in fall, which provides a high likelihood of protection under winter snow. Seeds germinate in spring following an obligatory period of cold stratification at 3-4 °C for 90-120 days. Germination is apparently enhanced by soil disturbance.\"
Acer platanoides is commonly planted as a shade tree because of its disease resistance, tolerance of poor soils, and overall attractiveness (Harrington et al. 2003). 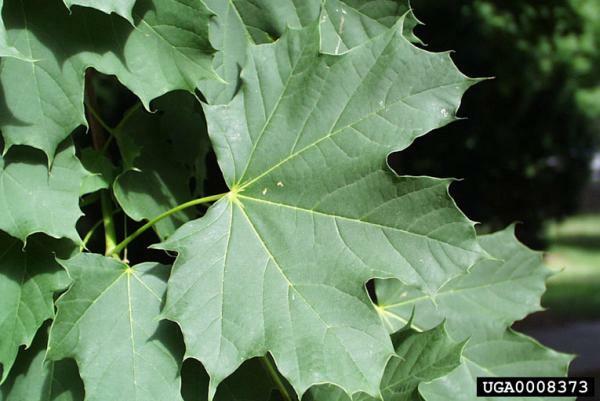 Recommended citation: Global Invasive Species Database (2019) Species profile: Acer platanoides. Downloaded from http://www.iucngisd.org/gisd/species.php?sc=979 on 22-04-2019. In North American forests where Acer platanoides has invaded, understories below its dense canopies exhibit reduced species richness, increased abundances of conspecific seedlings relative to nearby non-invaded areas, declines in native tree regeneration, and seedling pools dominated by A. platanoides. The high proportion of A. platanoides seedlings indicates that its abundance will increase over time. A. platanoides seedlings exhibit exceptional tolerance to shade and occupy understory when other natives cannot (Reinhart et al. 2005; Meiners, 2005). A. platanoides modifies habitats. A. platanoides also releases toxins into the soil that inhibit growth and reproduction of native species. Reinhart et al. (2005) report studies,which indicate that that A. platanoides foliage produce water-soluble antifungal chemicals which may alter the soil-borne mycorrhizae, pathogenic fungi, and decomposer fungi in ways that favour conspecific seedlings. The threat of A. platanoides goes mostly unnoticed as the majority are still saplings. These trees also prevent the establishment of a herbaceous or shrub layer, leaving much of the soil bare and subject to erosion. These modifications negatively impact native species, while simultaneously creating conditions that allow for its own proliferation. Reinhart et al. (2005) believe that, \"These modifications may open the door to gradual invasion by non-native species that have not yet arrived\". It is believed that A. platanoides suppress native vegetation by altering the quantity of light in the understory. Reinhart et al. (2005) have gathered evidence, which supports this claim. The authors found that \"Photosynthetically active radiation (PAR) was reduced by 95% beneath A. platanoides canopies.\" Native species that cannot adapt to these reduced levels of light disappear from the understory rapidly. Furthermore it has been determined that A. platanoides seeds had reduced predation compared to other maple species adding to its competitive ability (Meiners, 2005). A. platanoides also interacts with exotic species increasing their invasive potentional for example: \"Certain exotic vines (especially Lonicera japonica) and shrubs (especially Euonymus alatus) thrive near A. platanoides\" (Fang, 2005). 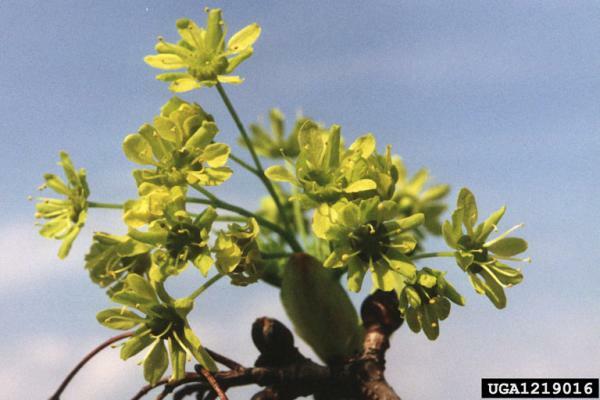 Research by Wangen and Webster (2006) suggests that widespread invasion by Norway maple is preceded by a long establishment phases as source populations reach reproductive age. The expansion phase may also be punctuated by periodic lags since individuals along the advancing front and satellite populations may require several decades before they reach the overstory and become reproductively active. 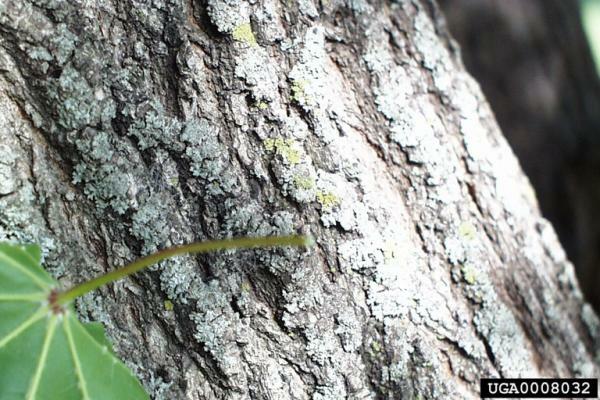 This lag behaviour may mask the invasive potential of this and other long-lived shade-tolerant invaders. Physical: Munger (2003) states that, \"Removal of overstory A. platanoides is necessary to end immediate recruitment of seedlings, but also That pre-existing saplings are likely to be abundant and should be removed to enhance growth and survival of native species and to eliminate potential future A. platanoides seed sources. Control efforts may require removal of A. platanoides outside the immediate vicinity of a treatment area due to the influx of seeds from relatively distant sources. Because removal of A. platanoides from a site may entail removing a large proportion of existing plant biomass, drastic changes in site conditions and species composition may result. 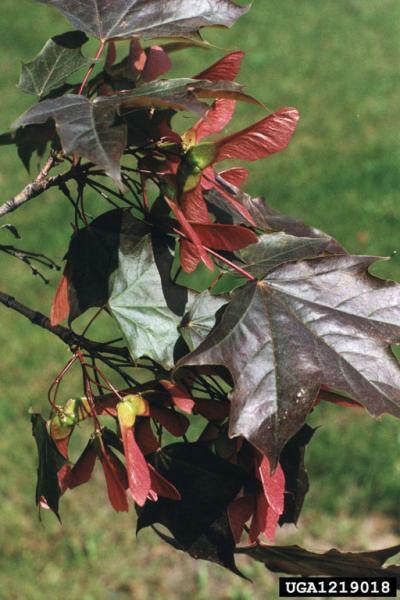 While such efforts will hopefully benefit native species, there is also substantial risk of facilitating invasion by other nonnative plant species.\"
Informations on Acer platanoides has been recorded for the following locations. Click on the name for additional informations. Canadian Wildlife Service. 2005. Norway maple (Acer platanoides L.) . Upland Species Accounts: 4.3 Minor Invasive Aliens. Meiners, S. J. 2005. Seed and Seedling Ecology of Acer saccharum and Acer platanoides: A Contrast Between Native and Exotic Congeners. Northeastern Naturalist 2005 12(1):23-32. Munger, Gregory T. 2003. Acer platanoides. In: Fire Effects Information System, [Online]. U.S. Department of Agriculture, Forest Service, Rocky Mountain Research Station, Fire Sciences Laboratory (Producer). Pennsylvania Department of Environmental Protection. 2004. Norway Maple -Acer platanoides Pennsylvania Field Guide Common Invasive Plants in Riparian Areas. Rich, E. L. 2004. Investigation of allelopathy in an invasive introduced tree species, Norway maple (Acer platanoides L. ). Drexel University. Wangen, S.R., and C.R. Webster. 2006. Potential for multiple lag phases during biotic invasions: reconstructing an invasion of the exotic tree Acer platanoides. Journal of Applied Ecology 43: 258-268. Agius, B. 2003. Revolutionary Changes to an American Landscape: Invasive Plant Species at the Minute Man National Historical Park. Technical Report NPS/NER/NRTR-2005/009. National Park Service. Woodstock, VT.
Fine, P. V. A. 2002. The invasibility of tropical forests by exotic plants. Journal of Tropical Ecology (2002) 18:687-705. Gilman, E. F., and D. G. Watson. 1993. Acer platanoides Crimson King Crimson King Norway Maple. U.S. Forest Service Fact Sheet ST-32. G�mez-Aparicio, Lorena; Charles D Canham, Patrick H Martin, 2008. Neighbourhood models of the effects of the invasive Acer platanoides on tree seedling dynamics: linking impacts on communities and ecosystems Journal of Ecology 96 (1), 78�90. Harrington, R. A., R. Kujawski, and H. D. P. Ryan. 2003. Invasive Plants and the Green Industry. Journal of Arboriculture 29(1): 42-48. IPANE (Invasive Plant Atlas of New England). 2004. Acer platanoides (Norway maple ) . University of Connecticut. Kloeppel, B.D. & Abrams, M.D. 1995. Ecophysiological attributes of the native Acer saccharum and the exotic Acer platanoides in urban oak forest in Pennsylvania, USA. Tree Physiology 15: 739-746. Martin, Patrick H. & Marks, Peter L. 2006. Intact forests provide only weak resistance to a shade-tolerant invasive Norway maple (Acer platanoides L.). Journal of Ecology 94 (6), 1070-1079. USDA-GRIN (Germplasm Resources Information Network). 2005. Acer platanoides. National Genetic Resources Program [Online Database] National Germplasm Resources Laboratory, Beltsville, Maryland. USDA-NRCS (Natural Resource Conservation Service). 2005. Acer platanoides. The PLANTS Database Version 3.5 [Online Database] National Plant Data Center, Baton Rouge, LA. Webster, C.R., K. Nelson, and S.R. Wangen. 2005. Stand dynamics of an insular population of an invasive tree, Acer platanoides. Forest Ecology and Management 208: 85-99. Zimmerman, D.U., J. E. Ebinger, and K. C. Diekroeger. 1993. Alien and Native Woody Species Invasion of Abandoned Crop Land and Reestablished Tallgrass Prairie in East-Central Illinois. Transactions of the Illinois State Academy of Science, 86(3-4):111 - 118.